SCORE has completely reviewed all available evidence relevant to the Trophy Truck class protest submitted by #97 BJ Baldwin against #21 Gustavo Vildosola, Jr. The protest alleges that the #21 race vehicle performed a pit service on the highway in violation of SCORE rules within Speed Zone 4 on Highway 5 south of Puertecitos.A video indicates that a black pickup truck with two male occupants moved directly in front of the #21 race vehicle on the highway and one of the occupants crawled out the sliding rear window and into the open bed. This person reached out and made physical contact with the #21 race vehicle in order to manipulate the front lightbar by using both hands with the intention of adjusting it upward into the correct position. This person then attempted to adjust the lightbar upward with a metal leverage tool. The #21 Vildosola race team responded to these allegations by stating that the black truck and its occupants were not associated with Vildosola Racing, but could have been fans trying to help out. SCORE is unable to conclusively determine whether the black truck occupants were in fact associated with the pit support team of Vildosola Racing, but this issue is not relevant to a resolution of the protest. The issue to be resolved is whether the #21 race vehicle received a pit service from the black truck occupants by allowing and accepting their actions. 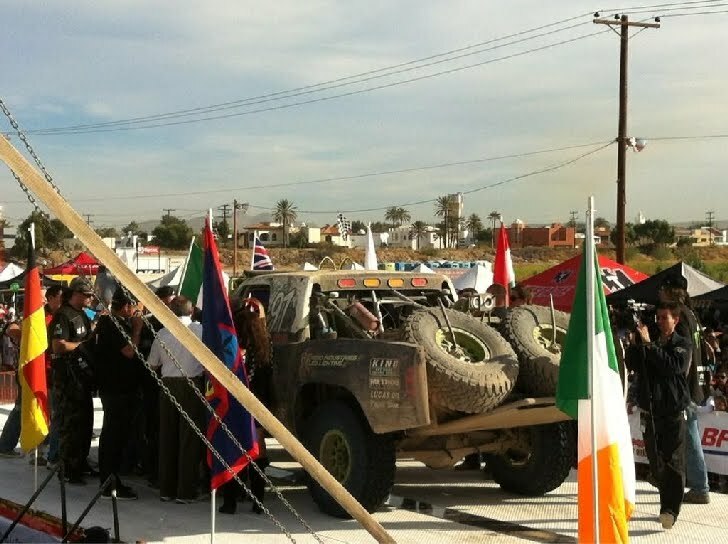 Receiving assistance from spectators, fans, locals, and other pit teams has always been a part of SCORE Baja racing, but such assistance must be performed within the rules. SCORE believes the video provides sufficient evidence to conclude that the #21 race vehicle allowed, accepted and received a pit service on the highway. The SCORE rulebook defines a pit service as any service performed on the race vehicle. Therefore, attempting to adjust a lightbar is a pit service. The fact that the pit service in question may have been unsuccessful, and therefore accomplished nothing, is irrelevant. Since the 2009 SCORE Baja 500, three competitors have been penalized 90 minutes each for pitting on the highway, so in accordance with this past precedent the #21 race team will be penalized 90 minutes.